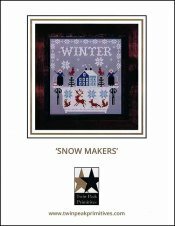 Snow Makers [W6153] - $13.00 : Yarn Tree, Your wholesale source for cross stitch supplies. Cross stitch pattern by Twin Peak Primitives. Let it snow, let it snow, let it snow! The snowflakes are falling as the wood is burning in the fireplace, keeping the house nice & cozy. Two snow covered trees stand next to the house, with a cardinal sitting atop each tree. Two women, one on each side of the trees, holds a needle & thread. A winter scene is stitched below the house, with a pair of scissors on each side. It's an enchanted wonderland. Stitch count is 105W x 107H.